Useful Contacts may be found here. 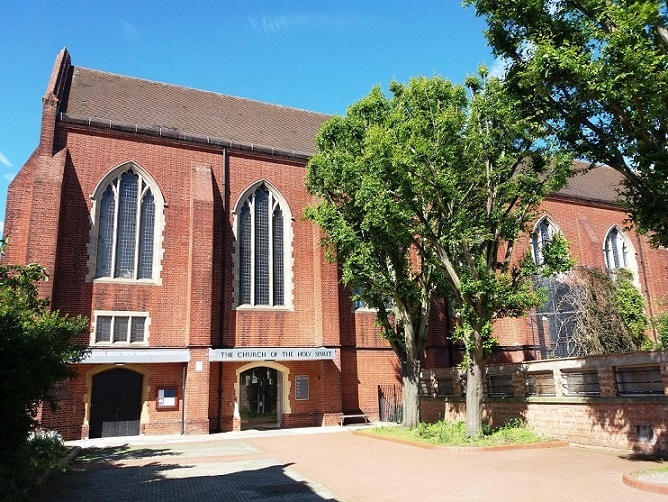 The Church of the Holy Spirit became the Parish Church of this part of Southsea in 1958, the earlier Church of St Matthew being destroyed in the war. It is our hope that everyone living within reach of the Parish Church in Fawcett Road will discover where they might come for worship and prayer, to have their weddings celebrated, their children baptised and their family funerals received by the Priest of their Parish. If you are a member of the Church of England, living in this area, or if you are someone who needs help or advice, someone perhaps who is enquiring about Baptism, Communion, Confirmation, Matrimony, etc; or if you would would like to learn more about the Christian Faith, then do please come along and meet us at your Parish Church. We are all God's children and members together of the human family. All are to be respected and cherished: whatever your beliefs we ask your prayers to the one God and Father of us all. The church experienced a vacancy in 2017, but since 13th August 2018 we have been joined by Father Russell Lawson, our Parish Priest. The people and Priest of the Parish of the Holy Spirit are in the care of the Bishop of Portsmouth with extended Epispiopal oversight by Bishop Norman Banks (Resolutions A B & C). We belong to the worldwide Anglican family of Christians who witness to the One, Holy, Catholic and Apostolic Faith of the Universal Church of our Lord Jesus Christ. To our brothers and sisters of other Christian traditions, and to men and women of all faiths and of none, this Church dedicated to the Holy Spirit of God extends a loving welcome. in love and service to you and to all mankind.